When it comes to spiritual warfare, many Christians have thrown in the towel after repeated defeat. But take heart! You can be victorious! Glory Warfare offers a powerful revelation on waging spiritual warfare from the place of triumph, God’s manifest Presence. Featuring revelatory teaching and powerful miraculous testimonies, you will discover how victory comes – not through formula or principle – but through Divine encounter! Respected prayer leader Becca Greenwood shows all believers how cultivating a lifestyle of encountering the Holy spirit is the secret to victory. In His presence, you will receive God’s assignments and directives for the specific challenges you are facing. Then, you can march into battle with the assurance of His victory on your behalf. Enter the glory realm of God to receive warfare assignments for the challenges and opposition you face. Fight with boldness and confidence because you are fighting as God has directed you. Pray, prophesy, and engage spiritual battle from the glory realm. Activate warfare weapons: the power of worship, prophetic decree, and the roar of the Lion of Judah! Operate as the Ekklesia, using Jesus’ keys of authority to bind the forces of darkness from the people, places, regions, industries, and geographies they occupy. Ignoring the war doesn’t make it stop. Don’t let the forces of darkness gain any more ground. March forth in the power of God’s Presence and wage Glory Warfare! Chapter 6: Creation Is Waiting for You! 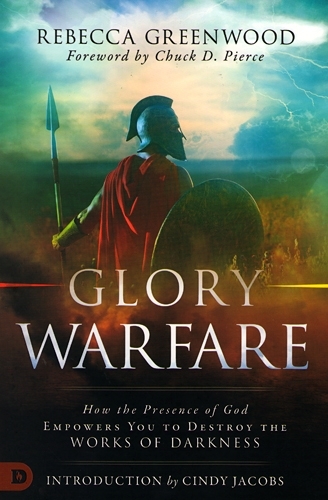 In Glory Warfare, Becca Greenwood helps believers gain new clarity on how to victoriously engage in spiritual warfare. As she points out, it shouldn’t begin by picking fights with darkness but rather by receiving our assignments from God Himself. This is a landmark book for Christians, especially in an age there is much confusion on how to battle victoriously. Glory Warfare directs you to first seek the presence of God, receive and steward the assignments that God is giving you form that place, and then implement the battle blueprints as He directs you. Greater intimacy with God equips and empowers you for deeper levels of spiritual intercession for revival and reformation. Rebecca Greenwood, a seasoned prophetic warrior, captures this principle in Glory Warfare, which is filled with Spirit-inspired strategies you can activate and apply in your prayer life. Her experiences and insight on prophetic intercession are powerful and timely for raising up intercessory warriors today. The stories and testimonies will encourage you to grow in your calling and authority as His royal priesthood as you receive biblical impartation of His glory manifest and stand in sync with His Presence, our Champion. Rebecca Greenwood co-founded Christian Harvest International, which ministers to the nations through prophetic intercession, transformational spiritual warfare prayer, and teaching of the word of God. Over the past 24 years, she has participated and led in spiritual warfare prayer journeys to 34 countries in which measurable transformations have been realized. Rebecca and her husband, Greg, reside in Colorado Springs, CO and they have three beautiful daughters.